Hi Friends! With Spring right around the corner, I'm in full organization mode. 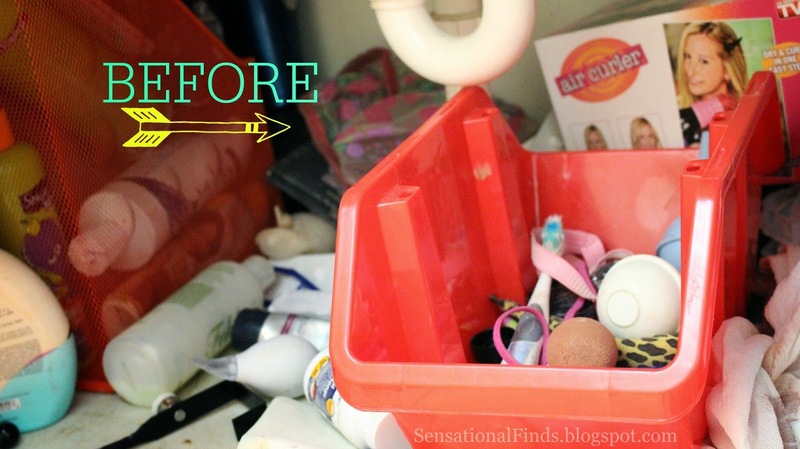 I'm tackling each "problem" area in my house, slowly but surely! Since having Quincy 9 months ago, we're noticing how cluttered our 2 bedroom apartment is. I decided to try to implement organization into our home, room by room. I took on the easiest area first, the bathroom! We're lucky enough to have great counter space and that in turn gives us great under cabinet space. I'm really the only one that keep things under the sink, so I didn't have to worry about what worked for the family. For my home and family, it's important that things look nice. This way we're more inclined to keep it looking nice. If everything has a "home" we all know where that home is and can put any items away, quickly. I feel like I was able to do this in this project, because my things are contained, labeled, and accessible. These DIY Lazy Susan's are so popular right now and they work so well. All you need is 2 cake pans and 1 package of marbles. Add a little washi tape and a you have a cute and functional organizational piece. 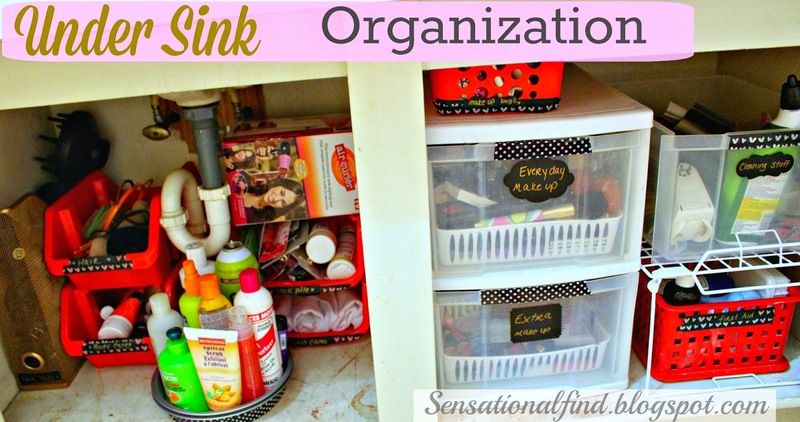 I hope this project was able to give you some organization inspiration! 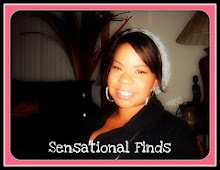 I love to look and see how others organize, it's motivating and inspiring. Especially if it's budget friendly. 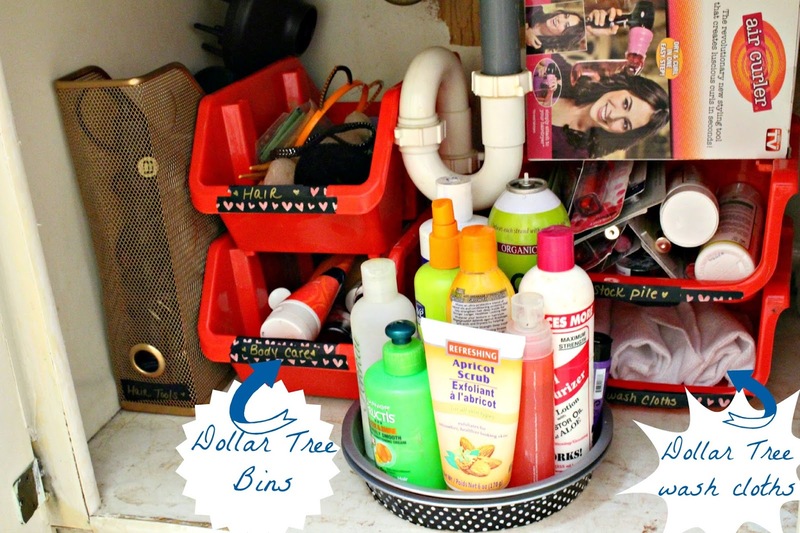 Dollar Tree is the place to go when you want to organize using bins. My second option would be Bed Bath and Beyond, this is because they offer a 20% off coupon so you can score some major deal.